Athos Menaboni was born in Livorno, Italy in 1895. He was profoundly influenced by his father, an avid hunter and naturalist, who expanded his family of five to include a menagerie of exotic animals and birds. Early on he studied under the great Belgian muralist, Daudelet. His career can be traced from that of a candle painter in New York, to that of Art Director at Davis Island in Tampa Bay, to eventually that of a commissioned artist in Atlanta, where some of his notable work was done for Robert Woodruff and the Coca Cola Company. 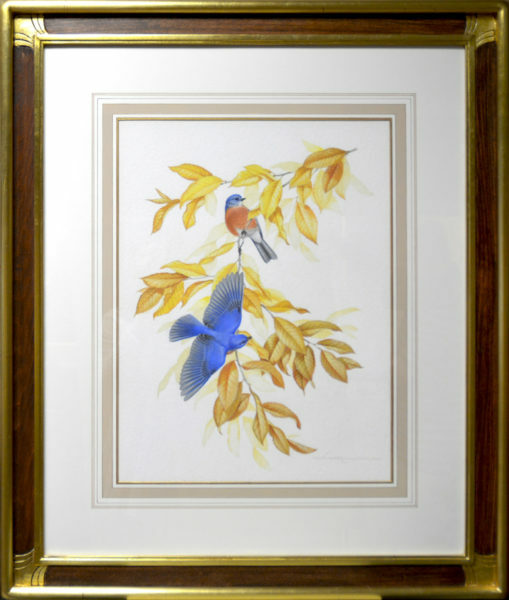 Menaboni was fervently inspired by the work of John James Audubon, and although his portraiture of birds began as a rather casual experiment between commissions, it quickly became an obsession with him. Ultimately this was the path to the realization of his greatest joy and the quintessence of his art, and the acknowledgement of his great work resulted in widely acclaimed exhibits at the American Museum of Natural History, the National Audubon Society in New York and The Don Russell Clayton Gallery at Kennesaw State University, Kennesaw, Georgia. Among honors awarded was the Georgia 1983 Governor’s Award in the Visual Arts. Both Menaboni and his wife devoted their lives to observing nature. Their reverent passion for life itself, revealed through Athos’ portraiture and the abundance of informative text compiled by Sara, continues to enlighten the minds and uplift the spirits of art critics, collectors, and naturalists alike. Comments This painting is in excellent condition in a hand carved frame, also in excellent condition.